intro to "Deleting ELECT in the bible"
The deal is, the main book the 1st Christians used as their bible was initially the Septuagint (LXX) - the Greek version of the Hebrew Old Testament, as seen quoted by Jesus and the apostles in the New Testament - to this was added the letters and the gospels. All of these were books of scripture for Christians in Greek. It was not till the 4th century that translations into Latin began. The evidence from the LXX is that the only word from which "elect" comes from as read by these 1st Christians is EKLEKTOS. And there, in the LXX, you read of the fat cows that came out of the Nile in Pharaoh's dream which Joseph interpreted as EKLEKTOS cows; The fat kernels of wheat were EKLEKTOS wheat; Young men - guys in their prime and thus the best to pick as soldiers - EKLEKTOS; pleasant land - EKLEKTOS land; highest branches - EKLEKTOS branches; choice silver - EKLEKTOS silver; With the pure thou wilt show thyself pure - EKLEKTOS . . . EKLEKTOS; And many more. If someone told me the bible I was reading did not mean what it says, I'd question it. This is what I did in the 90s when I came across Roger Forster's and V. Paul Marston's words in their book God's strategy in human history (Highland). They claimed that in the Septuagint (LXX) the Greek word EKLEKTOS translated in the New Testament as "elect" stood for something of top quality "choice silver" (Proverbs 8:19). I wanted to check this out for myself. I rang my old friend Dave Lock at Manna Christian Centre and asked him if he could get a copy of the Septuagint for me. He said "Would you like a concordance to go with that?". It so "happens" he had both there! I checked and found it true, EKLEKTOS stood for high quality in Proverbs 8:19. And then I found this so in a further 52 places. With only 23 places with the "appearance" of possibly being involved as "chosen" and that meaning, if valid, was in reality the exception; not the rule. I published this study in 2002 in a booklet and the Bible Society bought several copies. The doubt element of the "23" was included. This "doubt" in different forms has remained in my subsequent publications which involved the mention of EKLEKTOS. So, this year  I undertook to resolve this completely. Having discovered that 24 different Hebrew words are translated by EKLEKTOS in the LXX, I looked at every place these words are translated in the LXX. That is 594 places in the Old Testament (OT). 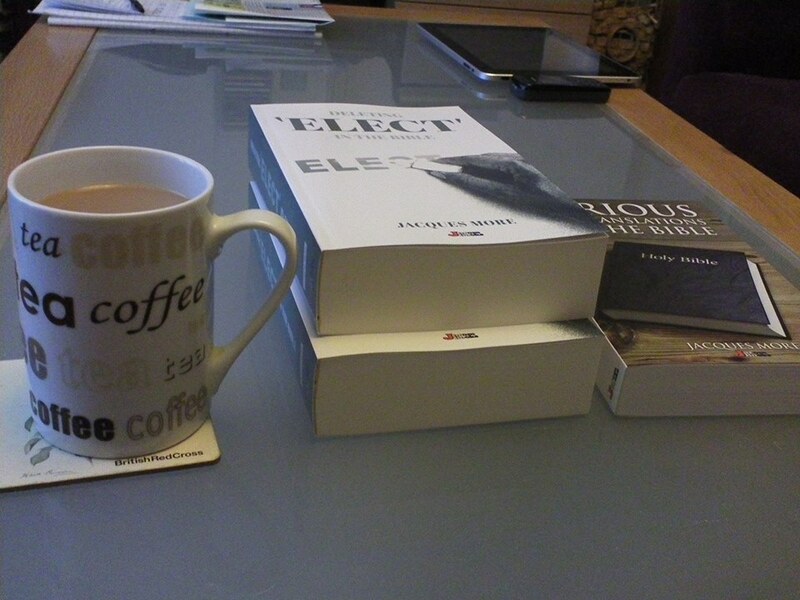 You can see every one of those in my new book which is thereby mostly a work of reference. As the analysis shows the total is 74 places where EKLEKTOS is found directly translating a Hebrew word. And the "doubt" is now completely removed by reasonable step by step observations made from the exhaustive examination in the LXX. 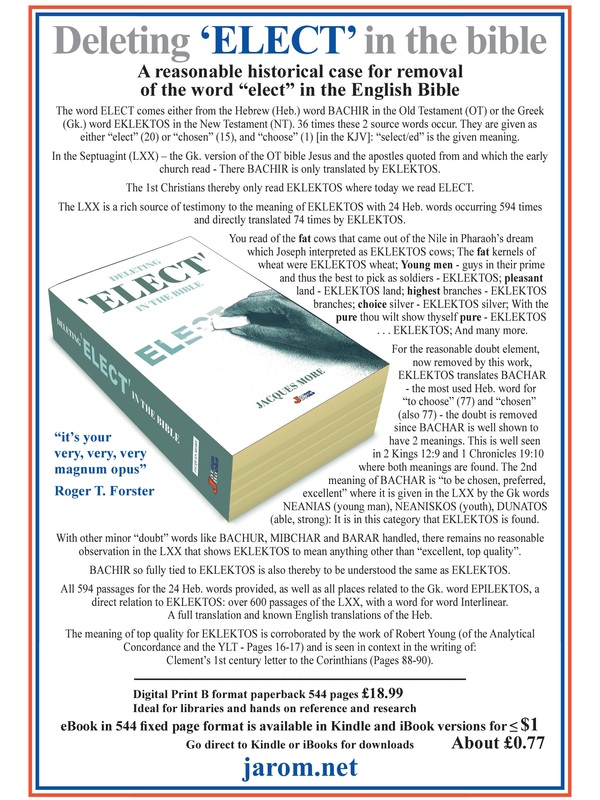 There is thereby no reasonable case for using the Greek EKLEKTOS and the Hebrew word BACHIR (which is only translated by EKLEKTOS in the LXX) to mean "chosen/elect/selected", but instead their meaning is well encapsulated by the English word "excellent". 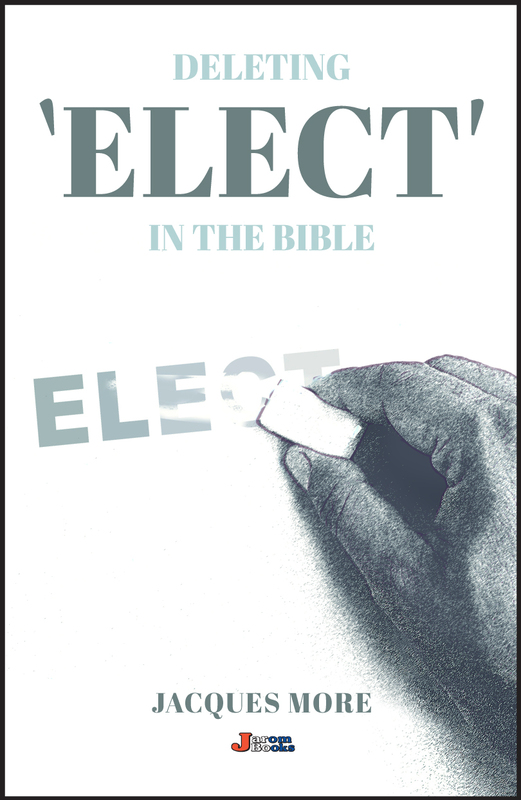 Since in the English bible the word "elect" comes only from either BACHIR in the OT or EKLEKTOS in the New Testament, it follows that the word "elect" should be removed from the English bible. Any bible teacher with responsibility for doctrine, when informed of this, should reasonably wish this on their book list.